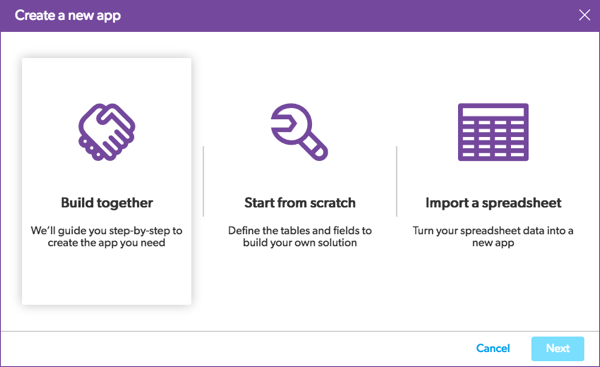 When creating an app, you can choose Build together and step through starting an app that directly relates to the problem you’re trying to solve. This feature helps tailor your app to include items specific to your business need. You step through questions related to your situation and make choices that result in an app that will track what you need. Your finished app includes guidance explaining how your app was assembled and contains sample data. If you are on the My Apps page, click Create new app. Step through questions related to your situation and make choices that result in an app that will track exactly what you need.